To trackstand is to balance on the bike while stationary. The pedals are at 3 and 9 o'clock and the front wheel is canted towards the front foot. Trackstands give you balance both left-to-right and front-to-back. Trackstands look cool. And they're useful. On the street, a trackstand at a red light keeps you on the bike, feet in the pedals, ready to hit it when the light turns green. But don't be distracted by the gawks of pedestrians who think they're seeing something impossible! In the velodrome, trackstands help you win sprints. In matched sprint competitions, racers use trackstands to get in back of each other. "In back??!! Aren't they supposed to be in front to win the race?" Well, at the finish line, yes. But before that point, being behind of the other racer can be an advantage. Only the finish counts, even if the race takes a long time. So if you can force the other rider ahead of you, you'll be able to save energy riding in their draft, and then burst around the last quarter lap in a great sprint finish! All the balance drills you've been doing will help with trackstands. Also, before you start practicing, it helps to choose a direction. For most riders, a trackstand is easier to learn on one side than the other. Trackstands can be assisted by a slight incline, such as the slope of the velodrome, or the rise in the crown of the road as you ride on the edge. 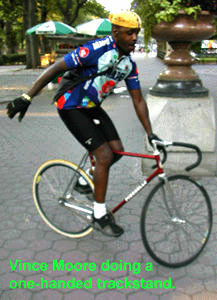 My own riding, for example, is mostly along the right sides of New York City streets. I encounter inclines on the crown of the road which slope up and to the left. So I learned trackstanding first to the left (Figure A). Riders in the UK or the velodrome might find it easier to learn trackstanding at first to the right ( Figure B). Comfort is another important factor in choosing a direction. Which is your "leading foot"? The "lead foot" moves to the front when you ride a skateboard or wind up to kick a football. Some folks find it easier to learn trackstanding with the lead foot forward, even if the slope in the crown of the road would dictate otherwise. 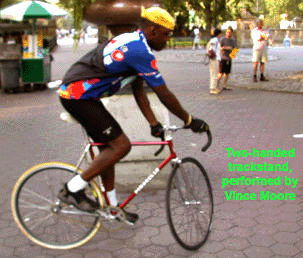 You can learn to trackstand on both sides, without canting the front wheel, without hands, and regardless of the slope. But, while learning, it makes sense to concentrate your efforts. 1. Decide on a direction. Ask your body which foot likes to lead, consult Figures A and B, try a few things and make a decision. The following steps assume the L foot forward direction, as in Figure A, but you can swap 'em easily. 2. Find a place in your practice parking lot that has a gentle slope in the proper direction. The slope should be of just a few degrees, like the crown of a paved road. 3. Make sure you're not clipped in. Ride toward the slope. Find a line of approach that puts the slope uphill to your left. 4. Stop when your L foot is forward, R foot to the rear with the front wheel turned 30-45 degrees to the L. The pedal angle will be horizontal, or perhaps the front will be slightly above the rear pedal, approaching a 10 o'clock - 4 o'clock angle. 5. This step is easier to do standing on the pedals than seated. With the front foot, push gently uphill against the slope for a few seconds, then release the pressure and let yourself roll back down a few inches. Repeat this several times until you feel the back and forth trajectory becoming more solid and stable. You will notice that because the front wheel is at an angle, your motion is side-to-side as well as forward and backward. This movement in both dimensions is where your stability comes from. NOTE: On flat ground, and partly on this gentle slope, the backward motion is accomplished by pressing down on the rear pedal. Freewheel riders supply the backwards resistance with their brake(s). 6. Concentrate on getting the forward and backward roll of the front wheel as slow and stable as possible. You shouldn't need more than 12 inches of trajectory. And the better your balance becomes, the shorter this distance can comfortably be. You can try it seated, but standing is easier at first. Looking into the middle distance is actually better for your balance. But at first, since you're still getting the angles and positions down, it's almost impossible to resist looking down at the front tire! 7. As you rock back and forth seeking a slow and stable motion, you will start to notice a point along the trajectory where you feel very well balanced. This is the "sweet spot," a place of peace and equilibrium. At first it feels like a very small and delicate place. But as you practice, it starts to open up and become easier to reach. You'll be able to stay longer and longer. This is your trackstand. 8. Play around. You can help open up the sweet spot by approaching the slope with your front pedal a bit higher or a bit lower. Try it seated. Try to hit it also on flat ground. Every once in a while, try the trackstand on the opposite side. You'll feel shaky and uncoordinated on that side, which will make you appreciate you nice it is to do on the side you're accustomed to! As you gain experience in landing in the sweet spot and losing it, you will see that you usually fall away from it in the same direction, either to the L or R. Use this information to compensate by bringing your body closer to the opposite side as you stand up and turn the front wheel. It's easier to practice standing than seated, because you can move your bike underneath your body more easily. As you rock back and forth and your bike moves, your pedals will need to be re-adjusted to find the 3-9 position. You can also practice your trackstand by meditation and visualization. Put yourself into it while sitting on a couch, lying in bed, or even while walking down the street. If you feel like you're losing balance and concentration but would still like to practice in the same session, then ride around for a bit. Try the balance drills. And after 10-15 minutes or so, give the trackstand another try. If you manage to hold your trackstand for an uncommonly long time, let that be it for a while. Don't push it for an hour or so. Go do some other riding. Let this one incubate and settle into your body. Next time you give it a try, your body will find it a bit more comfortable! Dance skaters say, "There are no mistakes, only moves." You can use this attitude. If you feel yourself losing the trackstand, make a stylish move out of it. Right before wiping out, whip your front wheel in a direction that will keep you on the bike, and ride coolly away. "Yeah, I planned that." Every time you're out, do one or two last trackstands right before you get off the bike for the day. This is what will imprint in your body until next time out.